The new boss has some big plans for the F2P shooter. 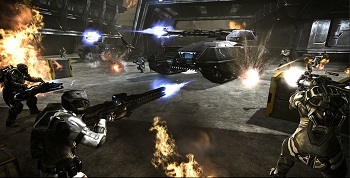 CCP launched Dust 514 earlier in the summer to a milquetoast critical reception. To spice things up a bit, it found a new executive producer in former EA man Jean-Charles Gaudechon, who's taking the positive view of things. Talking to Polygon, he says that "I do not see myself as a savior... I'm just coming here to grow that already awesome product that Dust 514 is." He's got a plan, and the first order of business is amping up the action. Gaudechon says that he wants to "really focus on that kind of visceral gameplay - that intense first few hours, first few days of playing the game - and making sure that we can engage more people into that world, into that fiction, and show you ... how deep and rich that universe is." He also has plans for the microtransactions, something that Destructoid feels "border on offensive". "You don't stop the movie to get a dollar from someone," Gaudechon said. "It's not a good experience." Before joining CCP, Gaudechon worked on EA's F2P games, like Battlefield Heroes and Need for Speed World. CCP has some huge ideas behind both Dust and Eve, and it looks like it's willing to put some extra elbow grease into realizing them.